Lunch Box Heroes by Matt Jackson and Christopher Stogdill is a coin flipping generic roleplaying game system wrapped around a flipping neat dice-pool-but-not-dice-pool mechanic. Bold, focussed and malleable, it's flipping well instantly likeable. You have Brawns, Agility and Brains. Yes, you, the flipping reader. Well done you. You like pain I know, so you chart that with Fortitude (how much of it you can handle) and Hits, for when the pain really does flipping hurt. Those are common to all characters. The player needs to get their thinking caps on to choose some flipping skills and gear. Gear is different from just "stuffs in my flipping pockets" because gear gives you a bonus. It's that magic sword with +1 of nasty paper cuts rather than 20ft of flipping rope your players demand even in a Minecraft flatland. Attributes, skills and gear are measured in coins, which is the number of coins you have to flip for a check. Heads are passes and you're aiming for a target number of heads to pass (1 is easy, 6 is impossible). That's the flipping. The player tries to combine an attribute, skill and gear to flip as many coins as possible so focussed characters are best. Draws, criticals, fumbles, healing, magic and experience points are all dealt with curtly and with common flipping sense. The flipping rules is roughly a page of reading, the rest is help. Help for The Judge (the GM/Ref/DM), examples of play, how to rip monsters out of other flipping RPGs. It's so neat that the whole system fits on a single flipping page, included at the back. I like the cover too, it has that unapologetic scruffiness that Lite RPGs do so well. Have you ever seen me flip a coin? No? It's not something you'll see twice because I'll have your eye out. I flip a coin the same way a snake juggles. Although the system is fast, (counting heads), the act of flipping isn't. If you're flipping 5 coins for an action, that's going to take time. It points out that you could use any even dice and count evens but then you'd be using a system much like every other. It's the flipping that's novel. I'd like to see some more use of typography, perhaps two columns, more paragraphs and the language can be simplified to make it easier for new or younger players. An extra picture or two would help - in the same style as the cover. I also don't think it's important to state that the game is about flexibility and having fun at the top. If a prospective player/GM has downloaded it, they know what a Lite system is all about. If not, they'll never be able to run it as the players will get stuck on creating their own skills (standard drawback of Lite systems). 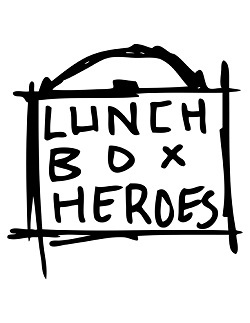 Lunch Box Heroes, is Lite, novel and familiar, well written and presented with plenty of assistance. It is different enough for you to download and read, print out the final page and fold it into your grab bag for when your GM is off gallivanting around Vegas. 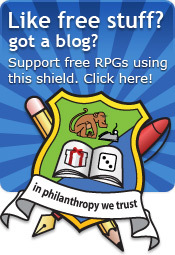 You might recognise Christopher Stogdill from the excellent Frugal Gamer blog. If you don't, then shame on you. Add him immediately to your feed reader. Don't use a feed reader? What is this, 1997? Oh, you get your English butler to read this out. Well, of course you do. Get him to read it out to you.